Every company offers more than its products. Whether it’s a piece of software or clothing, there’s also customer service behind it, and behind every customer service there are people. This article covers the top six customer service training tools that will help you turn new hires and even seasoned pros into communication experts. In fact, effective customer service starts with effective hiring. But even if your new employees seem to be wolves of Wall Street, they will benefit from the right training too. Develop your employees’ knowledge and soft skills. Whether you’re training support specialists, sales reps or other customer service professionals, it’s crucial that they possess up-to-date information on the product. An uninformed employee can easily frustrate a customer, which eventually will come to no good. To acquire knowledge and solidify it, your employees need practice. Of course, you could simply toss them in the mix, but using customers as “guinea pigs” may not be the best idea. Instead, try to use behavioral simulators that imitate real interaction with customers. This way your employees can practice in a safe environment and learn from mistakes that do no harm to anybody. Apart from knowledge itself, simulators help train important soft skills, such as empathy, positivity, the ability to listen, and others. This type of training can teach employees how to cross-sell and handle delicate situations. It can also identify their knowledge and skill gaps and tell if they are ready for the real thing. The following tools will help you launch simulation-based training. iSpring TalkMaster 8 allows users to create scenario-based dialogue simulations with voice overs that imitate real-life conversations. The software contains a ready-made collection of characters with different poses and emotions, as well as a location gallery. It’s also possible to upload custom images, for example, photos of familiar people and environments. Employees learn by choosing what to “say” to an interlocutor in a particular situation, and getting feedback based on their choice. Users can choose to imitate various situations, such as a phone call from a bank client, a face-to-face conversation between a sales manager and a customer, or even a support chat or correspondence. Characters may check employees’ product knowledge, ask them perplexed questions to see if they understand or misread the problem, and even get irritated to test employees’ patience in a challenging situation. The ready simulations can be published for the Web or an LMS. iSpring TalkMaster generates content in HTML5 and Flash, as well as SCORM, AICC, and xAPI learning standards. Tip: A great way to test product knowledge is to use frequently asked questions. Evenif there’s an FAQ section on your website, it doesn’t mean clients will consult it before trying to contact the support center. After all, they are not called frequently asked questions for no reason. iSpring TalkMaster is available for Microsoft Windows 10/8/7/Vista/XP(SP3) operating systems. The software costs $497 and it is a one-time payment. It’s possible to try iSpring TalkMaster for free for 30 days. See how far you can go in a sample dialogue simulation created with iSpring TalkMaster. ITyStudio allows users to create serious games and simulations without having to acquire programming or design skills. According to its developers, the only technical skills required are drag-and-drop, and right click. The software has a built-in library of animated characters and 2D and 3D environments that make simulations look extremely realistic. Apart from the characters themselves, learners can interact with objects and maps that redirect them to another scene of a simulation. ITyStudio has a flexible scoring system that enables evaluation of various skills, such as empathy, engagement, staying focused, listening, and others. These criteria should be defined by a user and linked to certain scenes in a simulation. It’s also possible to customize specific feedback for each skill that will give learners insight into mastered skills and areas of improvement. Overall, ITyStudio is made for developing highly interactive and engaging content, allowing learners to study in a game environment. At the same time, one shouldn’t underestimate the creation time, as there are a number of flexible settings to configure. ITyStudio works as SaaS (software as a service), which means that it’s accessed from the Internet and can’t be downloaded. There are two subscription plans available: for $220/month and $400/month. The 30-day free trial provides users with the full content library and all types of scenes, but prohibits export and limits the number of scenes to 20. Branch Track is another tool for creating scenario-based training. It’s a cloud-based solution, which means that all the simulations are created online in a browser. The drag-n-drop editor makes it easy to design a scenario tree and connect and move scenes. You can select from the built-in galleries of characters and environments, or import your own assets. All the characters are presented in different poses and emotions. Apart from dialogue simulations, Branch Track allows you to create video-based scenarios. To do that, shoot a few clips and add them to the branching scenario. It’s also possible to brand the simulation by adjusting the visuals to match your corporate style. Simulations created with Branch Track can be exported either to HTML5 for the Web, or SCORM for an LMS. However, the export option is only available under the Enterprise subscription plan. The Branch Track solution looks similar to iSpring TalkMaster and shares a few common characters from the e-Learning Brothers library. With its higher price, Branch Track is more suitable for the enterprise sector rather than small businesses around the world. Plus, you literally don’t own content because it’s in the cloud, and there is no option to publish a dialogue simulation to a single Flash file to easily distribute it using your corporate mail. There is an option to download dialog simulations in the Enterprise subscription plan only. A single-author license for Branch Track is $2,900/year with each additional author for $900/year. This plan covers 50 projects, branding, custom assets, voice over & video, online delivery, and email support. The Enterprise plan goes further and offers bulk pricing, teams, export to offline SCORM/HTML, personal account manager, custom onboarding and more. You can try Branch Track free for 14 days. Effective assessment will make both you and your employees aware of current knowledge gaps. Tests can help you monitor employees’ progress and measure training outcomes. It’s equally efficient to use a preliminary “placement test” to choose the right course for a particular employee. Finally, you can use interactive tests as an independent mode of instruction by providing learners with personalized feedback. These pieces of software will help you create comprehensive tests and publish them for the Web or an LMS. iSpring QuizMaker 8 lets users choose from 23 types of graded and survey questions, such as Multiple Choice, Fill in the Blank, Matching and others. Apart from the questions themselves, learners can see various information slides and feedback messages, depending on the answers they give. These can include images, graphs, formulas, audio, video, and other relevant content. iSpring QuizMaker is incredibly simple to use. Every question can be opened in a slide view mode (the way learners will see it). Flexible grading options include choosing a passing score, number of attempts, time limits, and more. Tip: When talking by phone or communicating in a live chat, customer service professionals have to act quickly. To see how well prepared a learner is, you can try setting a time limit per specific question or the whole test. iSpring QuizMaker publishes quizzes and surveys for the Web and LMSs. Those who don’t have an LMS can track learners’ results too: a detailed report with an answer breakdown can be sent to the indicated email or server. A lifetime license for iSpring QuizMaker costs $397. The free trial version is available for 30 days. An international leading wholesaler, METRO Cash and Carry, used iSpring QuizMaker to test product knowledge among its staff. You can read this case study here. Articulate QuizMaker ’13 is powerful software for creating animated quizzes and surveys. Users can add illustrated or photographic characters from the integrated gallery. The tool has 25 question types, including freeform questions that allow users to transform any object into an assessment. As a result, tests created with Articulate QuizMaker are visually rich and engaging. With Articulate QuizMaker it’s easy to test learners from all over the world. The software supports right-to left languages and double-byte character sets, which means that quizzes can be translated into Chinese, Japanese, and Korean. The program’s interface is similar to that of iSpring QuizMaker. There are two development modes: a form view and a slide view. Any question slide can contain images, audio and video. There are also a number of animation effects to choose from. Articulate Storyline is available for Microsoft Windows 10/8/7/Vista/2003/XP and Mac OS X 10.7.0 or later with Parallels Desktop 9+ or VMware Fusion 6+. A lifetime license costs $699, and further upgrades require additional payment. You can try the program for free for 30 days. For more information on these and other tools, check out this comparison of the top five test makers. Now that you have created e-Learning materials, it’s high time to assign them to learners and monitor their progress. To automate the management and tracking of your training courses, use an LMS. Whether your company resides in the same office or all around the globe, a centralized system will help you keep control of any number of learners. 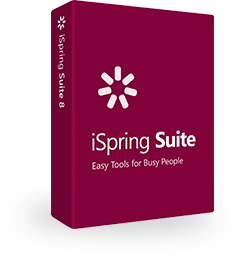 This system is perfectly integrated with the aforementioned iSpring authoring tools. Unlike with other LMSs, iSpring desktop tools allow direct one-click publishing to iSpring Learn right from the program interface. The integration also provides users with an advanced set of customizable reports, including user activity, performance summary, and others. Apart from iSpring-created content, users can upload any SCORM- or xAPI compatible courses, videos, Flash clips, audio, and supplementary documents (in PDF, DOC, XLS, and PPT). There are simply no limits on the number of hosted files. Both administrators and learners in iSpring Learn access content from a convenient content library. The account can be customized and branded to match any corporate style. Overall, the system has a user-friendly and intuitive interface with all the main options displayed on a left-hand menu. The price for iSpring Learn LMS depends on the number of active users, and starts from $127 per month. You can try iSpring Learn for free for 14 days. There are different ways to train customer service professionals, and different types of tools. Use dialogue simulators to develop product knowledge and practice in a safe environment. Simulations are all about making the right decision at the right time, just like in real life. Use a test making tool to identify employees’ achievements and knowledge gaps. Finally, an LMS will help you assign training and monitor the results. You can go further and create comprehensive, informative courses for your new hires and seasoned professionals. To learn more about authoring tools, check out this detailed comparison of iSpring Suite 8, Articulate Storyline 2 and Adobe Captivate 9.